In a previous post, I mentioned how we are leveraging ReactJS to create state-of-the-art web applications. We are now moving a step forward by also leveraging its sister technology, React-Native, to create portable, yet native, mobile applications. This comes with all the benefits of Darwino, which include a local JSON store that replicates for the best offline experience, and all the other services provided by Darwino! The fetch method calls the service identified by the URL and associated parameters, and returns the result. Behind the hood, such the API call will be either translated to a remote HTTP service call (online mode), or to a local API call (offline mode). This is done transparently by a dispatcher, so the developer does not have to worry about the current mode. It just works! This API can be called from any native application, regardless of the library/framework it uses. The API is provided as a library to be added to any existing application. On Android, it is a Maven artifact that you can reference from your gradle build file. On iOS, it is a Cocoa framework that you can add to your XCode project. Just add these dependencies and you’re ready to go! 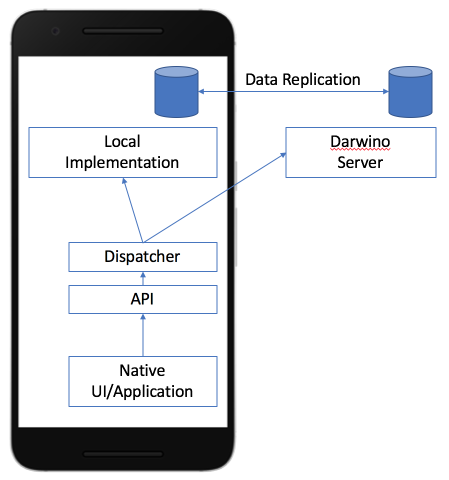 Wait, Darwino is Java based, so how can we provide a native Objective-C or Swift API? How can we get all the Darwino services, built-in and customs, to run natively on any device? As the goal is to have one single Java source code to ensure the consistency between all the platforms, so how is is exposed as an Objective-C API? The magic comes from J2OBJC. Right from the beginning, we have been very careful to write “portable” Java, meaning Java that can be compiled or transpiled to many different environments (JRE, Dalvik/Art, RoboVM, Multi-OS Engine…). As J2OBJC made a lot of progress these past years, it became easy to get our code transpiled to J2OBJC. The result is a tiny, efficient, native Objective-C library while sharing the same Java source code. With the potential to target other platforms in the future, like .NET: what about having your Domino data replicated natively to .NET?